If former justice minister Jody Wilson-Raybould felt she was being pressured by the Prime Minister's Office to help Quebec-based engineering firm SNC-Lavalin avoid criminal prosecution, she had an obligation to bring those concerns up with the prime minister, Justin Trudeau said Tuesday. "This resignation is not consistent with conversations I had with Jody weeks ago when I asked her to serve as Canada's minister for veterans affairs and associate minister of national defence. Nor is it consistent with the conversations we've had lately," said Trudeau, who referred to the former minister by her first name several times. "In regards to the matter of SNC-Lavalin, let me be direct: the government of Canada did its job and to the clear public standards expected of it. If anybody felt differently, they had an obligation to raise that with me. No one, including Jody, did that." ​Wilson-Raybould — who has kept largely silent since a news report claimed the PMO pressured her to help Quebec-based multinational engineering firm SNC-Lavalin avoid criminal prosecution — announced she was quitting the Liberal cabinet this morning. 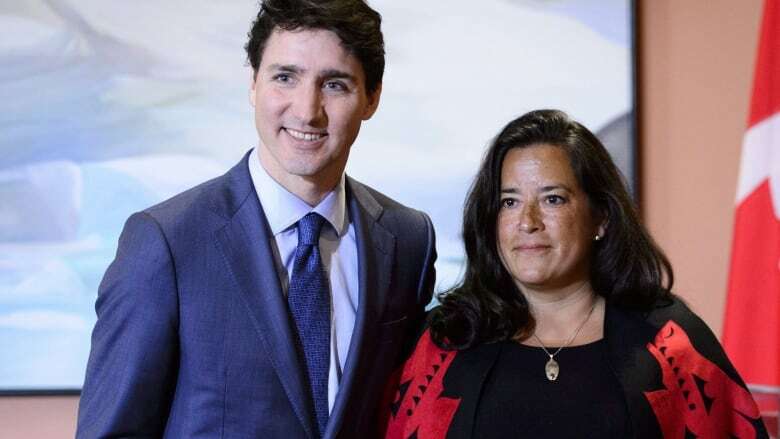 Trudeau said that he's consulting with Canada's new attorney general, David Lametti, on whether, and to what degree, he can waive attorney-client privilege and reveal details of his conversations with Wilson-Raybould on the SNC-Lavalin case. The prime minister warned, however, that his ability to comment might be limited by the fact that there are ongoing court proceedings involving the Quebec company. Trudeau tried to reassure Indigenous Canadians that, despite the resignation of the only Indigenous member of cabinet, the Indigenous reconciliation effort remains a priority for his government — and that he'll get his feedback on the file from Canadians across the country. "Our government's commitment to reconciliation is larger than any one person, and we will work closely with Indigenous partners as we walk this path together," he said. Wilson-Raybould, who was shuffled to the Veterans Affairs portfolio less than a month ago, has been under intense scrutiny since a Globe and Mail report alleged last week that the PMO wanted her to direct federal prosecutors to make a "deferred prosecution agreement" to avoid taking SNC-Lavalin to trial on bribery and fraud charges in relation to contracts in Libya. "With a heavy heart, I am writing to tender my resignation as the Minister of Veterans Affairs and Associate Minister of National Defence," Wilson-Raybould wrote in her letter to the prime minister, a copy of which she tweeted online. "When I sought federal elected office, it was with the goal of implementing a positive and progressive vision of change on behalf of all Canadians and a different way of doing politics." In a brief statement, Cameron Ahmad, a spokesperson for Trudeau, said Wilson-Raybould tendered her resignation when she and Trudeau spoke last night. The prime minister informed the rest of his cabinet in a meeting this morning and announced that Defence Minister Harjit Sajjan will serve as the acting minister of veterans affairs, said Ahmad. "Ms. Wilson Raybould's resignation makes it crystal clear that Justin Trudeau is trying to hide the truth with regards to the SNC-Lavalin affair," he told reporters in Fredericton. He said his party respects her decision to resign from cabinet "on principle." Scheer said he also sent a letter to Trudeau calling on him to preserve all the documents related to the SNC-Lavalin prosecution. "With his government in chaos and cabinet changes imminent, he must take steps to protect this information from being altered or destroyed," Scheer said. "As I've said before, Conservatives are keeping all options on the table to hold Justin Trudeau to account over this issue." Speaking in Regina, Public Safety Minister Ralph Goodale said it's "unfortunate" when any minister leaves the cabinet but deferred follow-up questions to the prime minister. Shortly after Trudeau made his statement, Jane Philpott, who assumed the role of president of the Treasury Board in the same cabinet shuffle that saw Wilson-Raybould demoted from the Justice portfolio, took to Twitter to voice her support for her former cabinet colleague. "You taught me so much — particularly about Indigenous history, rights and justice. I'm proud of the laws we worked on together ... I know you will continue to serve Canadians," Philpott said. Wilson-Raybould, who plans to stay on as MP for Vancouver-Granville, has been quiet since the original Globe and Mail story broke, saying she can't comment because she's bound by solicitor-client privilege. In her resignation letter, she said she has retained the services of lawyer Thomas Cromwell, a former justice of the Supreme Court of Canada, to advise her on "topics that I am legally permitted to discuss on this matter." In an email to CBC News, Cromwell said he would not be making any statements or doing any interviews. A spokesperson for MP Francis Scarpaleggia, chair of the national Liberal caucus, said that as of Tuesday morning, Wilson-Raybould hadn't left caucus. Her resignation marks a significant turning point in the emerging SNC-Lavalin affair. Just a day earlier, Trudeau told reporters that he continued "to have full confidence" in Wilson-Raybould. He also insisted, as he has since the story broke, that he did not direct Wilson-Raybould to come to any specific conclusions on whether to direct the Public Prosecution Service of Canada to reach an agreement with SNC-Lavalin. The House of Commons justice committee is meeting Wednesday to decide whether to launch a study of the SNC-Lavalin case. The Tories and New Democrats want nine high-ranking officials — including members of Trudeau's inner circle and the new justice minister, David Lametti — to testify before the committee. Liberal MP Anthony Housefather, chair of the committee, told CBC News he's "leaning" towards a study — but he has concerns. "I've been in discussion, ever since this meeting was called, with Liberal committee members. And what our primary concern is, will a study by the committee become an exercise in partisanship?" he said. "That being said, I also believe Canadians need clarity." The Conservatives have taken to tweeting out the Liberal committee members' contact information in a bid to have members of the public exert pressure on them. NDP MP Nathan Cullen, the party's critic for democratic reform, said the opposition members plan to meet Tuesday to discuss adding the prime minister himself to the list of public officials being called to answer questions before the justice committee. NDP Leader Jagmeet Singh also called on the Liberals to support the committee's push to look into the allegations. "If Justin Trudeau and the Liberal government shut the justice committee's work down, it would send a dangerous signal to Canadians about the state of our democracy," Singh said in a statement. "Justin Trudeau must be transparent, and we will continue to push his government to make sure Canadians receive the answers they deserve." Wilson-Raybould's resignation is likely to haunt the Liberals during the election campaign — as will a recently launched probe by the federal ethics commissioner. On Monday, Ethics Commissioner Mario Dion informed the NDP MPs who had requested an investigation that there is sufficient cause to proceed with an inquiry into Trudeau's actions in the case. Responding to a letter from NDP MPs, Dion said he would investigate the prime minister personally for a possible contravention of Section 9 of the Conflict of Interest Act, which prohibits any official responsible for high-level decision-making in government from seeking to influence the decision of another person so as to "improperly further another person's private interests." SNC-Lavalin faces charges of fraud and corruption in connection with nearly $48 million in payments made to Libyan government officials between 2001 and 2011. The company has pleaded not guilty. The case is still at the preliminary hearing stage.